The Earl Carl Institute for Legal and Social Policy is now accepting applications for the Marcia Johnson Outstanding Public Service Award (MJOPSA). 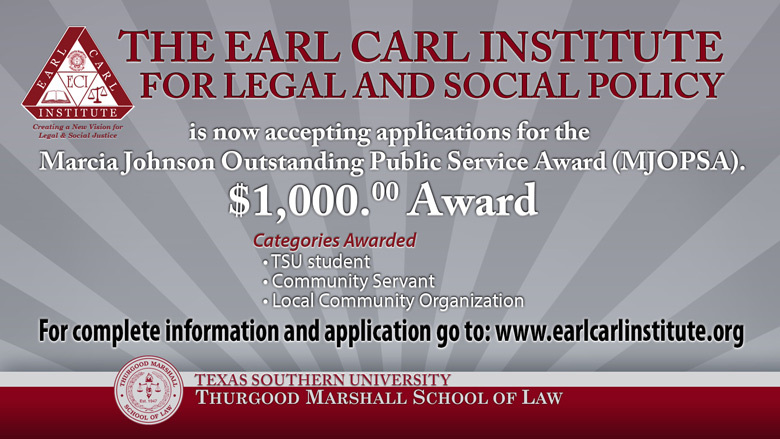 The Earl Carl Institute’s Annual Marcia Johnson Public Service Award provides a $1,000 award to a TSU student, a community servant, and a local community organization in recognition of outstanding public service. ECI is seeking nominees for each category that demonstrate an outstanding level of commitment, passion, innovation and achievement resulting in substantial contribution to public service that has made a real difference to people’s lives among communities of color and the traditionally disenfranchised. This award was established in the name of the Institute’s founder, Professor Marcia Johnson. Professor Johnson is a visionary in her own right. In 1992, she created the Earl Carl Institute for Legal and Social Policy, Inc. as a nonprofit organization sponsored by the Thurgood Marshall School of Law. The MJOPSA was established to recognize and promote broad spectrum public service that places a voice at the decision-making table that advocates for the interest of disenfranchised communities. Professor Marcia Johnson has served as a “voice at the table” for disenfranchised communities in a number of volunteer roles and has served on various national, state, and municipal boards and committees. Among others, she has served her community as vice chair of the Houston Forensic Science, LGC, Inc., Executive Committee Member of the Harris County Coalition for Juvenile and Criminal Justice Reform, and Member of the Board of Advisors, Annam Community Development Corporation. She epitomizes commitment as she serves as a mentor to many and an inspiration to us all. Must be a current student enrolled at Texas Southern University (graduate or undergraduate) with a demonstrated record of public service. Must be a community organization with a record of outstanding public service to the community and an annual operating budget of less than 5 million dollars. Must be an individual community leader with demonstrated public service and community advocacy. Awards will be based on the quality of your application, your public service record, and other personal achievements. Winners will be determined by the ECI Board of Directors. Please note that one awardee from each category will be selected. A total of three monetary awards in the amount of $1,000.00 each will be presented at the “A Voice at the Table”: The Earl Carl Institute’s Annual Marcia Johnson Public Service Award Reception. Completed application with the applicant’s name and contact information (see attached or you can access a fill-in the blank pdf application form which can be found on the Earl Carl Institute website at www.earlcarlinstitute.org under the Events tab). The Earl Carl Institute and the ECI MJOPSA Award Committee reserves the right to invite nominations as well. Completed packets must be submitted to the Earl Carl Institute by 5 PM on Friday, January 5, 2018. Submissions via email must be sent to lrdaniels@tmslaw.tsu.edu. Questions may be directed to Lucinda Daniels or Sarah Guidry at 713-313-1139. To learn more about the Earl Carl Institute visit us online at www.earlcarlinstitute.org.